We’re passionate about helping people learn ballroom dancing and, most importantly, to find out how much fun it is, and actually enjoy the process! 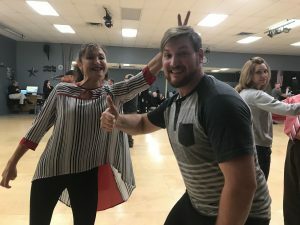 We have a professional team of fun, friendly, knowledgeable instructors who are all equally excited about helping you on your journey to achieve whatever goals you may have for your dancing. Whether you are learning for a wedding, cruise, competition, social activity or for the sheer pleasure of dancing, we want to assist you in achieving all your dance goals! If you’re new to Dance Tonight, whether you’re a beginner or an experienced dancer, be sure to check out our specially priced Introductory Package! It’s a DEEPLY discounted offer, good for a single person OR a couple, to make sure you get started off on the right foot! (Or the left foot if you’re a guy, LOL!) If you have any questions, don’t hesitate to get in touch. 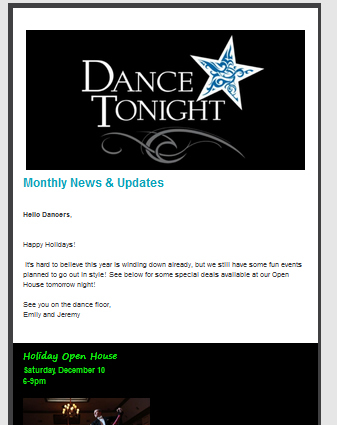 Be sure to sign up for our monthly newsletter, (on the right hand side of this and most other pages on our site) and you’ll probably want to follow us on Facebook so you don’t miss anything!